Kombucha is beneficial for the whole body. It treats the quintessence of the body. The mushroom juice is able to go to the root cause of the body's disharmony and interweave with the body's most subtle levels of vital force (prana, pneuma, chi). Its ingredients establish bodily harmony where there may have been disharmony. Helps to prevent wrinkling and removal of brown spots, i.e., it is a skin humectant when applied topically and simultaneously taken internally - working from within to without and from without to within! Helps to prevent the formations of certain types of cancerous cells. Reduces hot flashes during menopause. Strengthens kidney and bladder functions. Tones the heart, thus helping to prevent heart attacks. Helps to lower blood pressure and cholesterol deposits by softening vein and arteries. Guards against and helps heal arteriosclerosis, rheumatism, arthritis and ischmatic attacks. Assists in the treatment of thrombosis and thrombophlebitis. Assists in liver dysfunction and the liver's detoxification process. Alleviates many allergies and aching nerves. Helpful in the treatment of cataracts and other cornea problems. Stimulates cleansing of the gall bladder, and alleviates colitis and nervous stomach. Helps weight control by stimulating greater fat metabolism (burning off fat). Assists to level off glucose, thus helping to avoid sudden drops of blood sugar in diabetics. Also, if taken daily, it will optimize urea levels in approximately 100 days. Useful co-therapy in cases of bronchitis, asthma, coughs, usually alleviating these conditions in to to three days. Useful in preventing and treating gout and ulcers. By energizing and rejuventating cells and tissues, it improves joie de vivre and hence sexual potentcy. 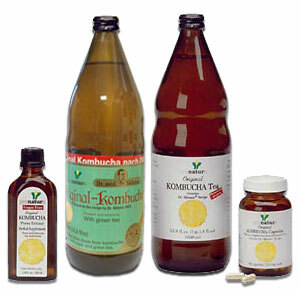 Kombucha is the ultimate protector of health and vitality. © 1998 - 2018 ProNatura Inc., All rights reserved. ProNatura Product Index. Designed and Hosted by RJT Design Studio .